are available in a variety of colors, sizes and prices. 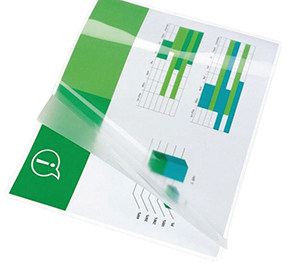 Lamination materials come in various thicknesses and finishes. The most common being 3 mil, 5 mil, and 10 mil. 10 mil: This is rigid and often used for report covers or awards. Small orders of letter, legal and ledger sizes (up to 12” X 18”) can often be done while you wait. Call us for pricing for large orders or other sizes. Hint: Think about printing your project on cover stock rather than standard paper. This will give you more ‘stiffness’ while reducing the cost of laminating. For instance, print your menus on cover stock and use 3 mil laminate instead of 5 mil. Paper is cheaper than plastic!